A video posted to social media shows a missing University of Iowa student sharing a personal story about prayer in 2016. Mollie Tibbetts' aunt posted the video to Facebook on Wednesday, two weeks after Tibbetts was last seen in her hometown of Brooklyn, Iowa. 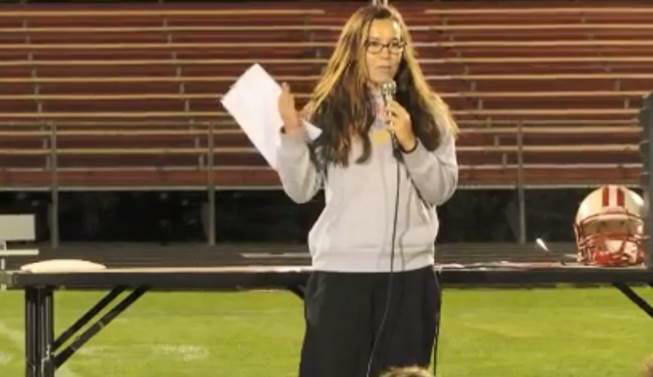 In the video that runs for about three-and-a-half minutes, Tibbetts speaks during a faith event at her high school. She said she was nervous about competing in an important cross country meet after not running in the two preceding meets because she had difficulty breathing and felt weak. "I had no idea what to do," Tibbetts said. "I was so scared, so for the first time in my life, I've prayed before, but I've never gotten down on my knees and just prayed to God, so I did. "I got down, and I prayed, and I asked God to give me the strength to make it through it, to tell me what to do, to help me out with whatever happened and to know what his plan was." Tibbetts said she ran her best time thus far that season. A friend later told her that she had been praying for Tibbetts. "In that moment, I kind of knew that that was God's way of showing me that the power of prayer was really something," she said. Tibbetts said that she knew her story may be trivial to others, but she described it as a way of seeing God working in her life. Tibbetts' family describes her as a light who loves to lift others, CBS News correspondent Adriana Diaz reports from Iowa. "Everyone has their own talent," Tibbetts said later in the video, "whether it's a sport you're good at or if you're good at dance or if you're a great writer, or even if you're just a good person — that's one of the best things you can be good at."